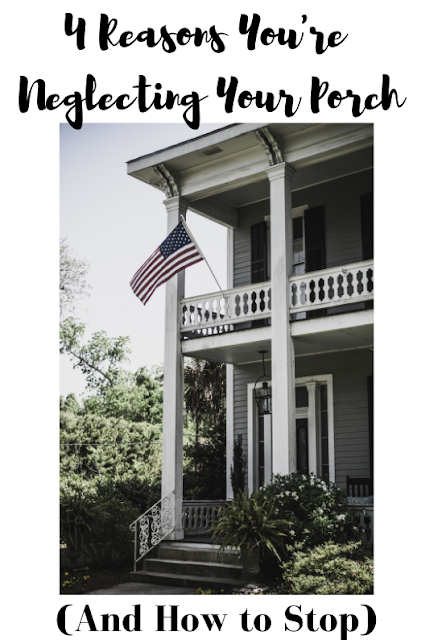 A porch is always a significant selling factor when it comes to buying property. This addition is something of a home bucket list item. It’s a quaint feature which provides real character to any property. The moment you see a porch, you may imagine sitting on a porch swing or drinking your morning coffee while chatting with your neighbors. Many of us love porches, and many of us would admit to being significantly swayed towards a property that has one. The trouble is, once we’re inside those homes, we fail to realize what we’ve got. That’s because, despite what they’d have us believe on the big screen, porches often go unused. If you aren’t careful, they’ll become a neglected home feature which you barely even notice. That can be heartbreaking, especially if the porch was the reason you bought that property in the first place. The trouble is that porches go clean out of our minds once we’re inside our homes. While we focus on things like decor and interior renovation, we often fail to consider exteriors. And we fail to consider our porches right along with them. When that happens, there won’t be a porch swing. You’ll never drink coffee as the sun comes up. Instead, your porch will fall into disrepair, which threatens to ruin your property rather than bring it to life. The good news is that it doesn’t have to be that way. If you’ve neglected your porch up until now, you’re not alone. Many of us make this mistake, and it stops us from ever being 100% happy with our homes. But, it isn’t too late. As with anything in your house, it’s always possible to turn it around. All you need to do is consider whether these issues are behind your lack of use here. One of the main reasons for lack of use here is an unsafe porch. If you risk putting your foot right through rotten wood as soon as you step off the main trail, you’re never going to try it. Equally, a porch which is experiencing foundation issues could become a hazard and a half. If your porch foundations sink so far that they come away from the top beams, you’ll never be able to use the space. Even worse, issues like these tend to be a vicious cycle. Things get this bad because you don’t use your porch the way you should. Then, you find yourself unable to use it as a result. It never ends. Until you take action, that is. The good news is that most porch issues have easier fixes than you would imagine. Reinforcing rotted porch panels with new wood could see you standing anywhere. Equally, turning to company like Helitech who offer porch mudjacking could cover you for any foundation issues. In an ideal world, you may find that you don’t even need to do this much. Often, issues here have even more straightforward fixes. It may be that a coat of varnish is all it takes to return your porch to its former glory. But, you’ll never know that unless you get out there. So, go on. What are you waiting for? Investigate the damage, and work out your easiest options for repair. You haven’t made it look the part. Sometimes, neglect here is nothing to with the actual condition of our porches. It may just be that you’ve neglected decor in this area. That alone could see you turning away from your porch rather than putting it to good use. Think about it; if a room in your home doesn’t look right, you close the door until you can tackle it. That’s what you’ve been doing on your porch all these years. The trouble is, you never get around to addressing it. Once you’re safe at home, you can ignore it altogether. By this point, the paint is flaking, and the whole thing looks a bit of a mess. There are still piles of leaves in the corner from last autumn, for gosh sake. You know what I'm going to say next, though, don’t you? It’s past time you tackled decor here, too. Your porch is the most prominent part of your house to passers-by, after all. It’s the first thing guests see when they arrive. So, making it look pretty matters far more than you’ve given it credit for until now. Lucky for you, decor here is often easier than it is in your house itself. All you need to do is invest in the right outdoor paints, and figure out how to craft a porch you can use. White is a popular color for porch beams, but it’s not your only choice. Bright porches can also work really well. Yellow is always a fantastic option, as is baby blue. You may even find that you want to strip paint off altogether and expose any wood for a rustic country vibe. This is fantastic for those who don’t have the time to keep on top of upkeep. If you aren’t sure which look you prefer, head online. There’s plenty of porch inspo out there which could see you wanting to spend every spare moment enjoying this space again. You haven’t given it a purpose. It may seem strange to talk about giving your porch a purpose. To some extent it does, after all, take care of that itself. Wrap-around porches frame properties. Some porch designs work to secure the foundations of a house. Others offer added levels of protection. Sadly, none of this is going to help you using the space. That’s why it can help to bring an added level of purpose to an area like this. You don't have to go wild with this if you don’t want to. Even something as simple as a classic porch swing could provide the incentive you need to get more use here. You’ll find it much harder to neglect your porch when you have the option of lounging with a book when summer rolls around. It’s certainly a better bet than a blank canvas with no seating at all. If that doesn’t work, you may want to go even further. Placing potted plants here could transform this space into a small garden for the whole family to enjoy. At the very least, that means you’ll spend time here watering the plants each day. You may then find that you stick around, seeing as you’re already outside. You may even want to turn your porch over to practical purposes, such as excess storage space. That may not mean you use the area more, but it would ensure that the area no longer went to waste. You may even find that turning this into an outdoor kiddie play area is your best bet at ensuring continual use. There are a whole load of possibilities. You get the idea though; purpose makes for a happy and well-used porch. If none of the above is behind your porch neglect, it may well be that privacy is the issue. The idea of sitting on the porch and chatting with neighbors is nice in theory, but it doesn’t always work out. If you don’t know your neighbors that well, for instance, you may feel overly exposed every time you head out. That alone could stop you from using the space. This issue becomes even more pressing if you don’t get along with your neighbors. Before you know it, years will have gone by without you using your porch properly. Unless you tackle the issue of privacy now, of course. In reality, there’s no reason you should put up with porch exposure. There are plenty of things you can do to add a level of privacy which keeps you happy. If you’re opting for the garden idea, tall and hanging plants can keep your porch a little hidden. By choosing the right spots for these, you could cover your neighbor’s view altogether. If that doesn’t make you feel safe, there are other options. There’s even such a thing as patio curtains which could help keep you out of view. In extreme cases, you may want to opt for an entire porch cover. This would stop anyone from seeing you when you’re using the space. It may seem extreme, but it’s a step worth taking if it saves your porch going to waste. If any of these pointers ring true to you, it’s time you get out and made some changes. It sounds to us like your porch is long overdue a little love, so go transform it into something you'll spend hours and hours in! Good luck! Definitely! Thanks for reading, Alex!